Soybeans are a great source of the anticancer compounds known as isoflavones. Genistein is the primary isoflavone responsible for stopping growth of tumor cells. It is believed to act as an antiestrogen, blocking the growth of hormone-responsive tumors such as those in breast and prostate cancer. Genistein is also believed to block angiogenesis, the process where a tumor develops its nutrient supply line to grow even further. However, for those who currently have breast cancer or are in remission it is cautioned that any consumption of dietary soy products should be practiced in strict moderation. 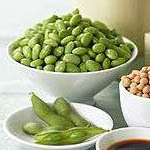 Dry-roasted soybeans, also known as soy nuts, and edamame contain very high amounts of isoflavones. Edamame may come in a pod that can be eaten right out of the shell or can be the soybeans alone. They usually are available in the frozen-foods section in the supermarket. They serve as a great addition to any salad. It is recommended that the safest method to eat soybeans is in its whole food form. Supplements should be avoided because it is unknown how much active ingredient is contained in them.